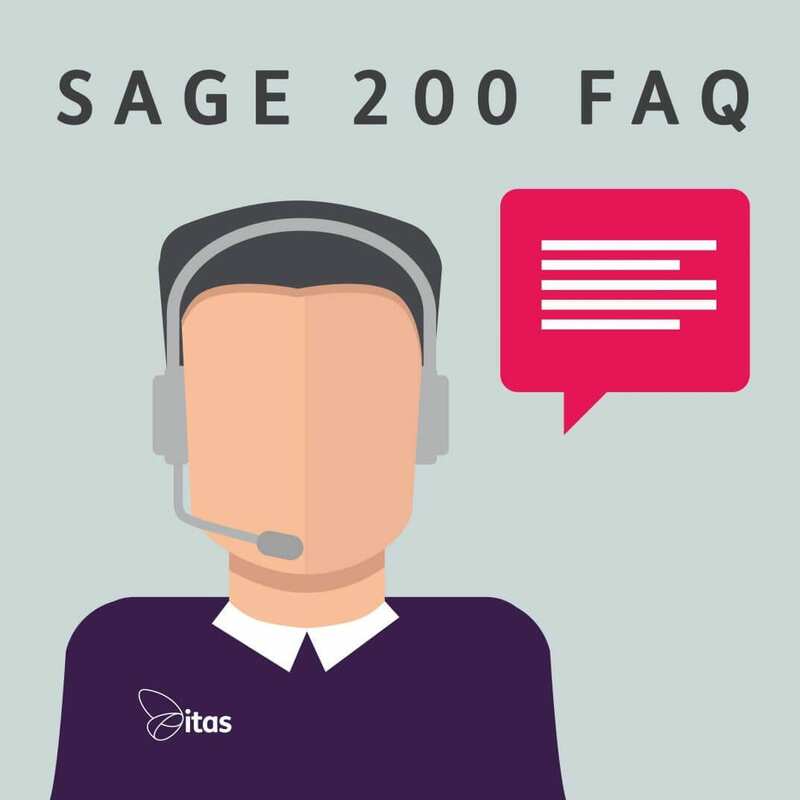 Here at itas we get multiple queries every day, via email, telephone and our online chat services all surrounding Sage 200. We have compiled a list of FAQ’s – particularly around adding new users that we get asked on a daily basis! 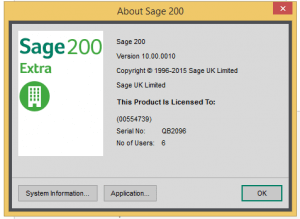 If you are running versions up to 2013, from within Sage, along the top left hand of screen, click on help and then about Sage 200.
,If you are running Sage 2015, you can still do the above, but there is also a cog in the top right of the screen, click this, about Sage. You will then get this pop up box giving you all info about the version that you are running. 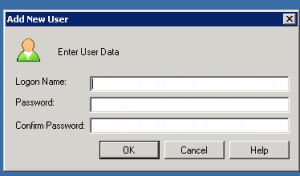 If you are running versions up to 2011, open up system admin, > users, > right click on users, > add new user, you then need to give permissions and a role to the user. Companies are listed down the left hand column, you would highlight the company, then send it to the right side by clicking on the single arrow, pointing to the right, repeat this process in the Member of, this is the role that you want them to have. If you are running version 2013 and upwards then firstly speak to your IT Department and ask them to add your windows user into the relevant group in Active Directory, either S200Admins or S200Users. Once this has been done you will need to go into System administration and update the users before giving the new user relevant company access and roles within S200 in the same way as above. Can I copy a role? 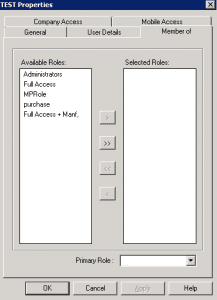 Yes, when creating a new user, it is possible to ‘copy’ a role, either by giving the new user the same role (the exact same permissions) or by right clicking on the role in the roles screen and selecting copy role- this will copy the role and you can make slight adjustments to the features of that role without having to go through and select everything. Can I set up different access for every different user? Yes, you can do this in two different ways! Firstly, you can specify which companies and individual has access to. 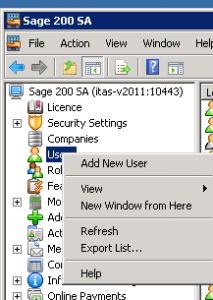 Once the user has been created in Sage, you would right click on that user, go into properties and specify which companies you want them to have access to. 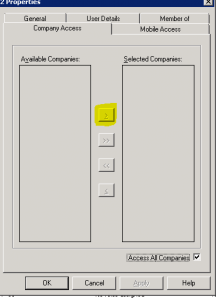 If you tick the Access all Companies option for a new user, they will automatically receive access to any new companies. Secondly you can set up a role specifically for that user to control the menu features they have access to. Traditionally you would have multiple users with the same permissions (i.e. the same role) but if you want to set user specific permissions you can set up a different role for each person. Just bear in mind that this means that you will have to manage more roles on an ongoing basis. Should I set up roles as their role within the organisation? Is it best to give them access to everything and then take away the features they don’t need? No, it is better to give the access that is required, as by giving access to everything and then removing features, you may mistakenly allow a user to be looking at / altering things that they shouldn’t/don’t need access to. The user has a role but when they login, they can’t see anything? This will be because when the role was created no features were added to the role, if you go back into the roles, right click on the role, features, you can add or remove features in here. I have added a feature for a person but they don’t see that option in their menu? Ask them to log out and log back in again. Also double check what role they are using. You can see this in the bottom left hand corner. Is there a way of making the company they are logged into more obvious? i.e. with colours? Yes, however, only with v2015. In the companies tab, right click on the company, properties, company colour, select the colour, test, okay, apply, okay. 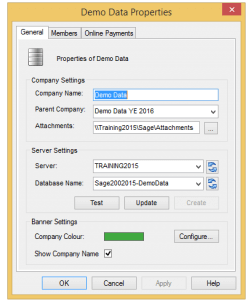 When you go back into that company in Sage you will have the colour that you selected as a coloured banner at the top of the screen. 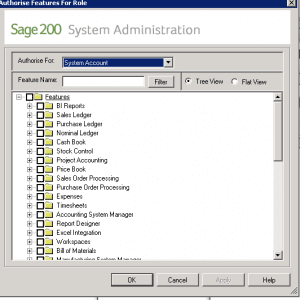 Can I see the menu options for a different role when I log into Sage 200? No, not initially, but it is possible by using other paths, depending on what version you are using. 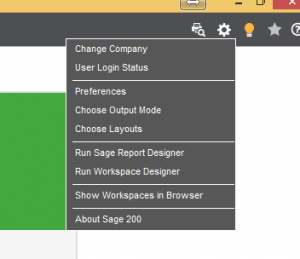 In Sage 2013 and below, you can change the role that you are looking at by going to file, switch configuration and selecting from the roles your user has access to. In 2015, you can right click on the menu item, filter menu, show all then you would be able to the different menu options for the different roles. What is the difference between apply and OK when setting up the features on the role? Apply will just apply the changes but not save it, by selecting OK you are applying and saving the changes all in one. So that’s it for the Sage 200 FAQ so far! We will be constantly adding to this article so please remember to come and check whenever you have a problem. If you do have any questions which you would like to be answered in the FAQ above please do leave a comment below or you can contact us on info@itas.org.uk.